We’ve talked about Celler Generi in Agullana before. Francesc is the only winemaker in the town and he makes interesting and very small-production craft wines. 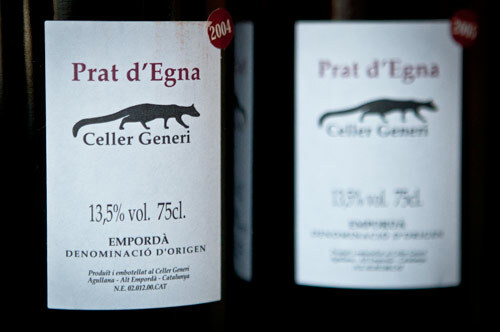 We took the opportunity of having both his 2004 and 2005 “Prat d’Egna” at the same time to taste one against the other. They’re both a blend of Merlot & Cabernet Sauvignon, hit about 13.5% alcohol, and are from the same fields. But, it’s quite amazing the difference a year will make. The 2004 is a buttery, round, chocolate bottle of wine. It’s smooth and round with a solid, yet yielding structure. Naturally, we’ve picked up as many bottles of this vintage as we could prior to its selling out sometime back as you can drink it on its own and probably would want to given the fullness of the body. By complete contrast, the 2005 vintage has a much higher acidity, a lighter body, and more floral elements to the nose. More suited for food pairings, it is more typical of the wines you often find in the region. Still very much delicious, but a completely different wine than the 2004. It was a surprising thing to see with these two wines given how much they share in common with one another. We’re just hoping to pick up the 2006 vintage soon and see which way it might lean.